As a designer he creates products that facilitates the working environment for the user, regardless if it´s a funtional or aesthetical soloution to a problem. His ambition is to constantly develop himself and... Read more his work to make sure he stays open-minded to new solutions all the time.While studing at Beckmans he cam into contact with the furniture manufacturer Mitab. He won the Stand On Your Own contest initiated by Mitab and was awarded the chance to create the Mitab stand at the Stockholm fair. 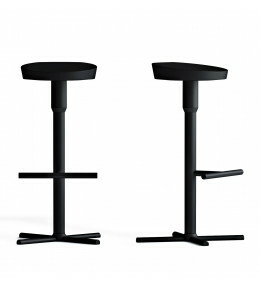 Nudo Barstools can rotate 360 degrees, with an ergonomic seat for comfort. Easy to clean and durable.